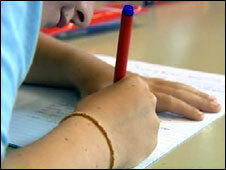 Questions are being raised about the quality of the marking of some of this year's school tests in England. Problems are emerging as schools get back pupils' scripts after delays at the test contractor, ETS. Some schools have been getting scripts back unmarked and in some cases pupils who took the tests are officially recorded as having been absent. Schools Minister Jim Knight says Lord Sutherland's inquiry will seek to answer all the questions raised. One primary school head teacher is so upset she has released examples of pupils' marked English tests. Janis Burdin, of Moss Side Primary School, in Leyland, Lancashire, described the marking as "abysmal" and "erratic". Asked to write a story about a fairground inventor called Pip Davenport, one pupil wrote: "If he wasent doing enthing els heel help his uncle Herry at the funfair during the day. "And had stoody at nigh on other thing he did was invent new rides." The child was given eight marks out of 12 for composition. Another wrote: "Quickly, it became apparent that Pip was a fantastic rider: a complete natural. "But it was his love of horses that led to a tragic accident. An accident that would change his life forever. "At the age of 7 he was training for a local competition when his horse, Mandy, swerved sideways unexpectedly, throwing Pip on to the ground, paralysed." This pupil was given seven marks out of 12 for composition, while both were awarded five out of eight for sentence structure. Ms Burdin said: "Reading the papers we were immediately aware they had been marked in an extremely erratic fashion. "Some children had more marks awarded than they should have and some far less." The National Union of Teachers called for the Sutherland Inquiry to consider the whether the results were valid or whether they should be annulled. Acting general secretary Christine Blower said: "I urge the Secretary of State to add a further criterion to his enquiry; that of deciding whether a subject's tests at each Key Stage are reliable or whether their reliability has been contaminated." 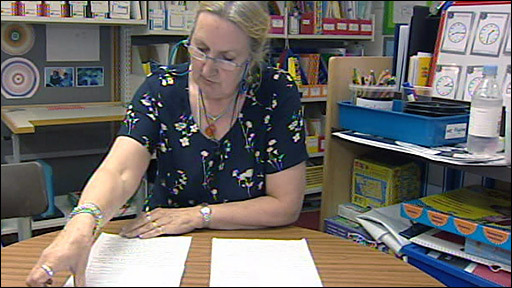 Head of the NASUWT teaching union Chris Keates said it was vital that all the issues surrounding the administration of this year's Sats were considered as part of the inquiry. The mystery of pupils being marked absent when they were not may be down to the online system ETS uses to track pupils' marks. Before markers can begin work they have to go through what is known as "script verification". This involves accessing a register of pupils who took the tests. 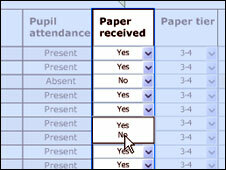 On it, they have to indicate whether they have received a paper for each pupil. If they had not the pupil was flagged as being absent. Head teacher Ian Miles of Wybers Wood Junior School in Grimbsy, Lincolnshire, found that more than a third of his pupils were shown online as having been absent, or with missing scripts. This was despite the fact that the school had received back all their scripts properly marked. ETS Europe has said there is more than one possible explanation for such problems. The situation might also arise if the school had not correctly completed the register in the first place. It accepts however that the common factor though is the computerised registration and mark capture system being used this year for the first time. Almost all the Key Stage 2 results were supposed to have been published online for schools to access on Tuesday - a week after they should have been available. It is still unclear when all the Key Stage 3 (14-year-olds') test results will be available, with English being a particular problem because it is more time-consuming to mark than the other tests, in maths and science. The ETS results website is next due to be updated on Friday 18 July, then again on Tuesday 22 July. The Conservatives called for government to drop ETS in time for next year’s exams. Shadow schools secretary Michael Gove said: "Every day brings new evidence of their serial incompetence. Ministers must act now to ensure next year’s exams are run properly."